In late September, U.S. anthropologist Richard Price received the Fernando Ortiz Foundation Award for his important contribution to the first conceptualization of the Maroons and formation of Maroon communities common in various colonial spaces of the Americas. This year, Richard and Sally Price were decorated by France’s Ministry of Culture as Chevaliers de l’ordre des Arts et des Lettres for their “significant contributions to anthropological research and the development of critical thought about museums” [contribution déterminante au rayonnement de la recherche anthropologique et au développement de la réflexion sur les musées de société]. 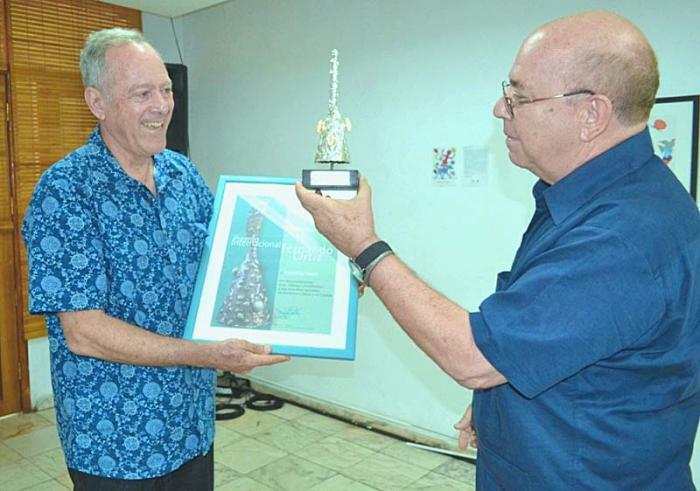 Noted anthropologist and historian Richard Price received yesterday at the UNEAC [Union of Cuban Writers and Artsist] the International Fernando Ortiz Foundation Prize, named after the famous Cuban scholar. Miguel Barnet, president of the UNEAC and the Fernando Ortiz Foundation, presented to the prestigious anthropologist a diploma and the Adyá [a sculpture in the shape of a bell used to invoke the Obbatalá], which usually accompanies this recognition, and stated that this merit exalts the figure of Ortiz. Writer Nancy Morejón, president of the Cuban Academy of Language, gave flowers to Sally Price, who has worked tirelessly beside Richard and to whom Barnet extended the prize. Dr. María del Carmen Barcia delivered words of praise, which highlighted the vigorous work of this paradigmatic figure in research of the subaltern cultures.